Imagine Housing communities are home to over 1,200 people with diverse backgrounds, needs, and goals. Allison, Nanda, and Michell met over a community meal at Velocity. All warm, open people, they recognized common paths that led them to Imagine Housing. Each had had a good job and bright future, but had an unexpected and traumatic experience that derailed their plans. Velocity apartments offered them a chance to regain safety and stability, and as 3rd floor neighbors, they “just clicked.” They have been practically inseparable ever since. The three started cooking meals together, (“because it’s hard to cook for one person!”) and now have dinner together 2 or 3 nights a week. “Now that I’m housed, things have only gotten better. I feel more stable and I feel like I’m making progress with my mental health at the VA, which gives me a chance to better my quality of life,” said Allison. Marcel is “loving life these days.” He is a resident at Imagine Housing’s Francis Village and is thankful to have a place to call his own. Marcel left New York for Washington in 1992 at the age of 29 to establish a relationship with his father. He has had the opportunity to enjoy everything that the state has to offer, including water skiing and horseback riding. Marcel worked as a commercial driver most of his life but an addiction eventually caused him to lose his livelihood and end up homeless. He started out couch surfing and wound up living on the streets. He worked hard to not look homeless so that he could find indoor places to spend the day. After a nearly fatal bicycle accident left him with a head injury, Marcel struggled to relearn basic tasks and he is still working on getting better. He entered the program at Congregations for the Homeless and was successful at turning his life back around. Three years ago he came to Francis Village, and he feels stable for the first time in many years. Today, Marcel feels blessed to live in an apartment he can afford and to have a place to rest his head every day. “I don’t want to be outside again – I like turning lights on, turning lights off, and taking a bath…just little things that people don’t realize. 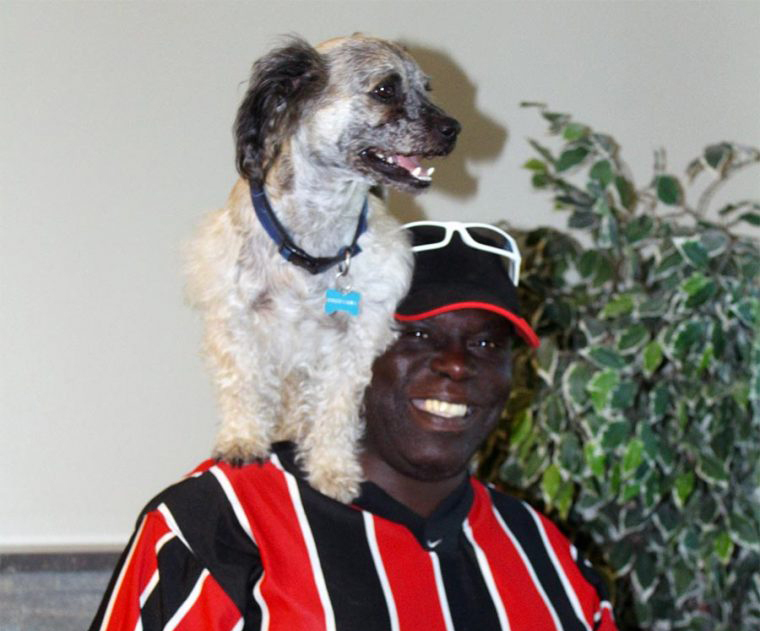 It feels good putting the key in the door and locking the door when I leave.” He enjoys spending time with his neighbors, going to community events, and hanging out with his service dog, Duke. He appreciates the Imagine Housing staff who help him and thanks God every day for Francis Village. He hopes to someday drive again and is proud to have retained his commercial license. For the first time in years, he feels good about himself, where he is and he works to inspire and teach others to take one day at a time.